Yes, yes, y’all it’s the 2014 Hoodie Awards! 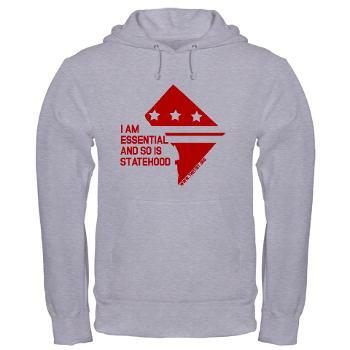 The Hoodies (state-Hood) are the awards for good and bad work in the D.C. statehood world. There’s no cash or material “award” rather it’s public praise or condemnation for efforts on behalf of or against the people of the District’s desire to be free and equal citizens. Awardees were selected through an intensely subjective and unscientific process. There are way too many people doing great things that weren’t bestowed Hoodies this year but we in the District owe them all our thanks (looking at you: Anne, Anita, Dara, Elinor, Jerry, Kelli, Kesh, Peter, and on and on). You are free to agree and disagree with these selections and I hope you all will strive to achieve your own Hoodie for Good in 2015. We all have the potential to receive this barely recognized District based award so let’s go out and earn those Hoodies! In 2013, we gave Senator Carper a Hoodie for promising to hold a hearing on statehood and since he actually held the hearing this year certainly he deserves another Hoodie for keeping his promise. He (and his staff) should be credited with finding liberal and conservative experts who testified on behalf of the bill helping to demonstrate that we have the moral and constitutional backing for statehood and all that’s lacking is political will. View the hearing or read the testimonies here. In all honesty, I was scared out of my mind when I saw his name on the panel for the statehood hearing. I knew he supported voting rights but had never seen him articulate an opinion on statehood. I was way more than pleasantly surprised with his testimony. His testimony stated that Congress had broad authority under the Constitution to admit new states and that the District’s path to statehood would follow a similar path to how Ohio became a state. If you’re up for a stirring statehood read check out his testimony here. Most people don’t tweet about DC statehood. Most Senators don’t think about DC statehood so to have Senator Cory Booker tweet his support for statehood for the people of the District of Columbia that definitely earned the Hoodie for Tweet of the Year. And were we to give a Hoodie for best speech on the floor of the Senate, Senator Booker would get that too for his speech against the budget deal in which he discussed the D.C. riders & the overturning of a the District’s marijuana referendum as one of many reprehensible components of the budget deal. It’s very exciting for the future to have Senator Booker on the Homeland Security & Governmental Affairs Committee and look forward to he and Senator Carper shepherding the bill though committee in a few years and onto the Senate floor for passage. Yes, passage! Johnny Barnes and Anise Jenkins for decades have been walking the talk to make the chant “Free DC, Statehood Now” a reality. While the statehood movement is undergoing a resurgence over the last few years, it has been the work of Johnny, Anise, and countless others who have led the charge over the last few decades to keep the statehood fire burning. For their work in the Halls of Congress and the streets of D.C. both Johnny & Anise have earned Hoodies for Lifetime Achievement. Martin Moulton ran to be our shadow Representative in the U.S. House of Representatives as a Libertarian. Martin was a very effective a powerful voice for statehood in meetings on the Hill and made both powerful cases for statehood from a conservative ideology perspective and as the son of an immigrant. Martin walks the talk of libertarian ideology which fits perfectly with statehood because it is the only way to #LiberateDC. Usually one of the pre-requisites for running for elective office in the District is to give a humdinger of a speech on D.C. statehood but then do nothing substantively to advance the cause once in office. Charles Allen gives us hope that this trend will end because over the last year he’s given time, thought, and effort to advancing the statehood cause. Charles participated in several advocacy days on the Hill, helped promote Flag Day activities in support of the statehood cause, and went door-to-door to business on Capitol Hill asking that businesses put up pro-statehood signs (an idea suggested by Elissa Silverman) in the lead up to the hearing on statehood in the Senate. Charles has been a workhorse more than a showhorse for statehood and for that he has truly earned his Hoodie Award. Jimmie Lithuli for organizing two discussions with WIN to help raise awareness about how and why statehood would be the best solution to protecting the reproductive rights and health care decisions of women in the District. This is a model that should be replicated to raise awareness about how statehood affects other key public policy areas (marijuana, criminal justice reform, courts & prisons, environmental issues, voting rights, etc.) for the people of the District. At the end of 2014 focused on the fact that Congress and the President passed a budget that overturned a referendum (prevents the District from “enacting” the referendum) to legalize small amounts of marijuana in the District. The DC Cannabis Campaign, however, should be praised & given a Hoodie Award for their organizing work that got Initiative 71 on the ballot in the first place. Though needing 22,373 signatures to get the initiative on the ballot the DC Cannabis Campaign submitted over 57,000 signatures to the District’s Board of Elections to ensure the initiative made it on the ballot. Initiative 71 is about marijuana legalization but it is also about the District’s right to set our own laws. For the organizing work that the DC Cannabis Campaign did in 2014 they truly earned their Hoodie. Two years ago Joan Shipps crafted a proposal for the Netroots Nation Conference that was not selected but undaunted she persevered and in 2014 her proposed panel on statehood was selected to be a part of the national conference. The panel focused on the history, need, and moral underpinnings of the statehood cause. Joan also organized a statehood panel at Roots Camp. These national conferences are great venues to spread the statehood message to a wide audience of activists who live in the 50 states. Jaime Fearer & Geoff Hatchard made their way to the Left Coast but kept the District in their hearts and their cause on their license plates. They have also engaged their representatives in Congress encouraging them to support the statehood bills in the House & Senate. If we had D.C. expats like Geoff and Jaime in the 50 states the statehood cause would progress much faster. D.C. diaspora please follow their lead, we need you!!! Dan and Amanda individually have great artistic talents but as a married couple and as statehood supporters they were able to combine their talents this past year. Dan led the way in organizing a benefit concert at Tropicalia and even joined in on a few songs. It was a great way to reach and bring in new supporters to the cause. Amanda made great t-shirts for sale to support the cause and designed our organizations dope new business cards. We all should tap our inherent talents and put them to the statehood cause the way Dan and Amanda did in 2014. Roll Call covers the statehood movement and thanks to Hill Blotter reporter, Hannah Hess, the movement has been covered quite well. Given Roll Call is the paper that covers happenings in Congress it has served the cause well to have both statehood progress & congressional meddling in District affairs covered so thoroughly. It is extremely important for Hill staff & members of Congress to see and read about the statehood cause on a regular basis. Thanks to Hannah & all of her colleagues in the 4th Estate around the District who have done well to cover this cause. This guy spent the entire year trolling the District devising ways to halt or overturn District laws related to both the decriminalization and legalization of marijuana in the District. At the end of the year with a federal government shutdown looming Doctor Harris got his way by inserting language that prevents the District from ‘enacting’ the referendum. While there is debate over when the enactment starts, Dr. Harris gave it his all to troll the District and act in a manner subversive to the principles of democratic governance. As much as we in the District have focused our wrath on Andy Harris we should not lose sight of the fact that Democrats and Republicans voted for the budget bill that overturned the vote, voice, and will of the people of the District. There will always be grandstanding ideologues like Andy Harris and as long as there are complicit enablers who vote for their crazy bills (components of bills) they will continue to do what they do. The more you know about Steve Stockman and Kerry Bentivolio the more you should question whether the District wants to be a state in the union or an independent nation nestled within the union because if Americans elect these clowns to Congress do we really want to be a part of it? Thankfully these losers are leaving Congress but before they left Mr. Stockman introduced language to mandate and open a gun range in the District and to ban speed cameras (originally a bill of Mr. Bentivolio’s). Happy trails you crazy bastards and I hope a speed camera got you both when leaving the District! Outgoing Senate Majority Harry Reid broke our heart at the end of the year when he allowed provisions overturning the District’s marijuana legalization referendum and allowing previous social policy riders to remain. Senator Reid is a statehood bill cosponsor making his willingness to go along with a bill that so fundamentally goes against the principles of statehood is quite troubling. And as the Senate Majority Leader he could and should have told budget negotiators that the District was NOT on the bargaining table but he didn’t. He supports statehood but when push came to shove he didn’t stand up for the principles of statehood and let the District, once again, be a bargaining chip in federal budget negotiations. And yes, President Barack Obama deserves a “Heartbreaker Hoodie” too for voices his support for statehood earlier this year but not standing up for our right to self-determination when push came to shove. In some respects we need to give Senator Coburn mild praise for actually showing up to the hearing on statehood (aka doing his job) in the Senate and we should acknowledge that he admitted there’s something not right about our disenfranchised status…but mild praise stops there. If anyone personified IDGAF body language it was Senator Coburn at the statehood hearing. He appeared to nearly nod off to sleep, made dismissive remarks about the statehood cause, and left early. For his attitude, mannerisms, and words at the statehood hearing Senator Coburn gets the Hoodie for IDGAF. And that’s it for the 2014 Hoodies, there was more good than bad awardees and yet we’re still subject to the whims of a Congress where we have no voting representation. High praise goes out to so many who have done such great work this past year but we still have a long way to go so let’s get back to work. Josh Thanks for the Shout out! It was an interesting year and meeting you was wonderful! I am so excited to be a part of this movement! Looking forward to 2015 and our work in the 114th Congress! Your leadership is beyond fantastic! DC get on board, join us in this work – we need you!